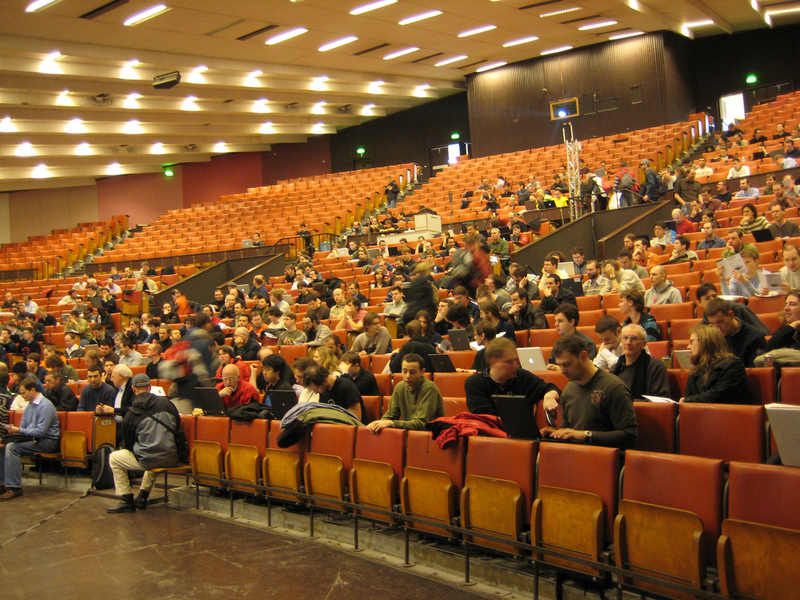 Last month, I read 'Another Thing I Didn’t Learn in Grad Schools: It's All About Relationships' on this blog. I was not only impressed, but couldn't agree more. It seems to me one more fitting piece in a series of wonderful and inspiring blog posts from the past few weeks and months. 'As we speak about relationships we speak about emotions as well', I wrote to Jessica, and she asked me to write a blog post about it. I wasn’t sure at first, but I decided to give it a try. And here we are. "You can't find Empathy at an Appstore"
A summary of changing minds, changing emotions, and changing needs, given in a one sentence philosophy. A very powerful statement, too. People are creating, people start building their own People's Libraries, responding to social-economic changes, cut downs, closure of small, local libraries. The real innovation is taking place right there, in self organized, spontaneous, ardent, and mostly volunteer based projects. From my point of view libraries have to reconnect with their basic issues, with their communities, with innovative projects outside, with life outside, supporting the spirit and the force from inside the community, without boundaries, without selections. Let's take time to listen and to communicate, to share knowledge and skills, to co-create and to find a cooperatively way of working together. The shortest distance between two people is a story. We've gone a long way on the technical highway, an endless highway without any speed limit, but in some ways we’ve raised human isolation to perfection. We’ve made it possible to be connected to the world without being connected to anyone in real life. There are studies forecasting isolation as one of the most dangerous trends of the era. Despite that, am I against technical progress? No, absolutely not! A library is the place for makerspaces, for fablabs, for getting in contact and learning everything about the latest tools. I’m very much for technology, but it's also essential to create a place of respect, kindness, helpfulness, trust and reliance. A place where it's enough to be just the person you are. A place that feels just fine. I'm not saying 'back to the good old days', what I try to say is: Back to humanity, back to a real social way of life. That is what I'm dreaming of, talking about the future of libraries. But will it work? I don't know. But I'm convinced that it's more than worth trying. Books: Important Symbol or Annoying Physical Reality? The question in the title is something that I've spent a lot of time considering. It's plagued me almost since the very beginning of my career, but I think I know the answer now. "So," I can hear you asking, "what are books? Are they an important physical reality? Or are they a magical symbol?" My answer: Both. Why am I bringing this up now? Lately there's been a flurry of controversy about libraries DARING to get rid of their books in favor of other things - study space, computer labs, learning commons, coffee shops, etc. Part of me thinks those must have been slow news days, since libraries have always weeded their collections. But, slow news days or not, there has been a lot of outrage and I can't ignore it. Since I'm most definitely a bibliophile, I can understand the impulse to treasure the printed word. However, as someone who's hip-deep in what is probably going to be a multi-year weeding project, I can also speak to the annoying, dust-covered reality of old books. So here I am with a blog post. Philip Deloria - libraries should have traces of the past, should also induce humility. Emotional experience of encounters with knowledge. I don't want to descend into the "you have no idea what you're talking about, outsiders!" territory, although it's tempting - there are lots of comparisons to be made to other service professions on the tip of my tongue. But no... as tempting as it might be, that's not the point of this blog. I want to help us all be better librarians, and after a certain amount of griping it becomes counterproductive. Instead, I want to talk about my desire to find a middle ground, a way of accommodating the visceral responses of those who fetishize the printed word while still serving their real needs. That phrase, "their real needs," sounds a bit high handed even to me - and I'm the one who wrote it. But really, I can't help thinking about Jakob Nielsen's piece, "First Rule of Usability? Don't Listen to Users," and a related quote from Steve Jobs: "It's not the customer's job to know what they want." I'm not Steve Jobs. I'm not even Jakob Nielsen. As much as I might admire those men for their clear vision, I don't feel comfortable dismissing community voices. This means I can't go into "damn the torpedoes, full speed ahead!" mode with collection development. Books are absolutely a symbol, and an important one at that. As I've said many times before, no matter what else we might be/do/have, "the library brand is still books." All of this means that no matter how annoying the physical reality of books might get, gathering dust, attracting bedbugs, rotting in colorfully staining ways, I can't disregard the symbolism. So I communicate as much as I can with my community when we weed. We have posted a sign near our book sale area that explains how books end up on those shelves. I give faculty in related departments a heads up when we are weeding, doing everything I can to solicit their feedback. When I run into people in my community who don't want to listen, I deal with it on a case by case basis - sometimes giving in to their wishes, sometimes insisting on the library's needs, and sometimes finding a compromise. My point is that we need to respect the dual nature of the books within the library's walls. As Chris Bourg said, "It's about the books AND the symbolism of the books." And, no matter what, always remember to stroke the spines of the nastiest ones. How about you? Do you have a preferred method for dealing with the false dichotomy? My favorite part of my job is getting in front of a class of students who are probably bored and would rather be anywhere else, and somehow drawing them in, getting them awake and interested. This usually happens as soon as I walk into the room, since I don’t look like what most people think of when they think of a librarian. I am a rambling, big, burly African-American guy, covered in tattoos, and I tend to not fit the librarian cliché, though I sometimes do wear my glasses perched on my nose just so. You never know when the librarian stare needs to be implemented. Even though I get attention with just my physical presence, I don’t stop there. I am very much a people person and like to meet the students in my classes halfway. I work primarily with majors in the School of Communication which includes journalism, film and video, and strategic communication, so the work tends to be topical. Their research usually draws upon current events and pop culture, and ties back to established communication theory and principles. This kind of thing can still be boring in the wrong hands, but I make sure it isn’t. If a student throws out, “I want to do some research on feminism”, and I say, “Let’s look at something like the impact of say…Beyoncé and feminism just as a starting point”, they tend to think that’s cool. Because Beyoncé. I use this tactic not because I want to be seen at the “cool librarian”, but because it can remove the wall that a lot of students put up. My goal is to be accessible. My agenda is not to just stand up and lecture about library resources for a paper the students will write two months from now. I want to establish a relationship. I want them to know that I am their subject specialist, a person who once upon a time worked as a freelance writer, a filmmaker, producing music videos and commercials, and a person who loved studying classical film theory as well as documentaries. These are things in my toolkit that, as their librarian, I can bring to bear over the course of their time at my school. Those are my intentions, and things have always gone according to script. Until recently. I had my first real panic late last semester when I was working with a new professor. Not only had I never worked with this individual, but s/he taught an introduction to media 100-level course as well as a 400-level class that deals with specific research in communication marketing. I gave myself plenty of time to learn the database the professor wanted demonstrated since I’m somewhat new myself. I was scheduled to do sessions for both classes on the same day – a day where the professor would not be present and I’d have the students, whom I’ve never met, all to myself. I tend to keep my nervousness at bay, however when I walked into the 100-level course ready to talk basic database searching, and how to find electronic copies of say Rolling Stone and Entertainment Weekly in our journal finder and found out rather quickly that it was the advanced research class where I would be performing a demonstration of this software I honesty wasn’t very keen on, the students noticed. I am proud to say that it wasn’t a disaster. I took a couple deep breaths and recovered. I was able to demonstrate how to use the database to pinpoint what sports drink a video game playing male, between the ages of 18-25 who preferred Xbox over Playstation and played between the hours of midnight and 3am and used an Android phone, is most likely to purchase and why. 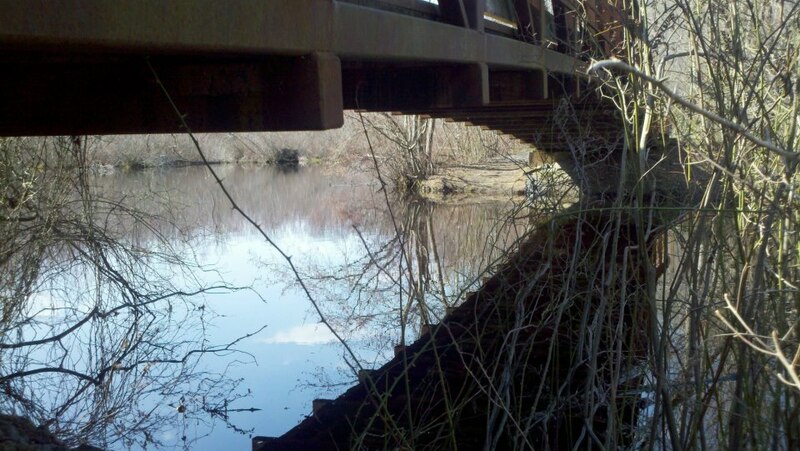 What struck me, however, came next. Two graduating seniors lingered as the rest of their peers headed out the door after the class was over. They made a point of telling me that not only had they enjoyed my presentation and taken copious notes about the database, they also remarked how funny I was. Then they went further and asked to buy me coffee and talk shop about library school and what it was like. The catalyst for that moment was my apparent cat-like reflexes. They had seen me thinking on my feet and readjusting after realizing that I had mixed up my classes. They said that was a skill they see in lots of librarians. They said librarians, more than anything, are prepared and go above and beyond in helping people. For me, removing that wall, helped them see me as someone who isn’t just there to tell them How Things Should Be Done, but also as someone for whom knowledge can move in both directions. Sometimes we feel the need to be super-prepared and super-professional, but it was that moment of being human and making a mistake that helped me connect with the students. I don’t recommend making mistakes like that if you can help it, but I do recommend being who you are with your patrons. Derrick Jefferson is the Communications Librarian at American University in Washington, DC. He received his MLIS in 2012 from Louisiana State University in Baton Rouge, LA as a Project Recovery scholar based in New Orleans. He tweets about food, vinyl records, and libraries at @geekandahalf. It’s a bit of a cliché, but it’s a cliché because it’s true: one of the most consistent aspects of life is that it is always changing. This is true everywhere, be it personally or professionally. Despite this, people and organizations are terrible at dealing with and managing change. I’ve been though a great deal of change over the last several months. I started a new job where most of my responsibilities deal directly with change.The organization itself is also going through a great deal of change, of which my work is only a portion. I think my position is not that uncommon. More and more young librarians [Editor’s Note: or even not so young.] are being asked to breathe fresh life into organizations, spearhead efforts to modernize services, or be all around agents of change (just don’t ever actually use this term). The good news is that while change management is difficult, it is entirely possible to do so successfully without previous experience. Nobody likes change. That’s something I’m sure you’ve heard before and I’m sure you’ll hear it again. I think this is especially true of the library world. Libraries were traditionally, and sometimes still are, viewed as a storehouse of knowledge. This thinking runs deep and is constantly reinforced. That means you will hear ‘Because that’s how we’ve always done it’ echoed through libraries everywhere, at an alarming rate. It’s an easy habit to fall into, more so during a time when the very future of libraries is uncertain at best. I tend to come at this from the opposite view. If you are engaged in a process or policy that’s only justification is that it’s always been that way, I can’t think of a better reason to set said policy on fire, and use the flames as a guiding light toward a new and better future. It is possible to document, record, and preserve the past while still being forward thinking. Unfortunately, that means change management in libraries will require a bit more work than in any other environment. You can see this play out in perhaps the most basic of library functions: collection weeding. All too often hands are rung about what should be weeded and people outside the library don’t understand why the library doesn’t just keep all the books forever and ever. That book has a history and unfortunately, to make room for the space to create new history, that book might just need to be tossed. 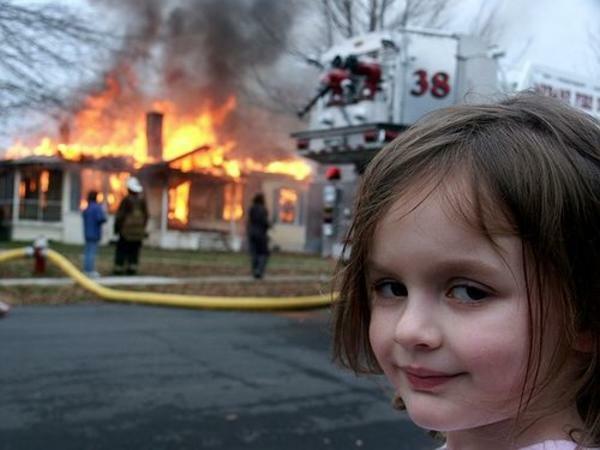 Or better yet, set it on fire. So you are tasked with making changes, where do you start? The first thing to keep in mind is that you cannot be an expert in everything. 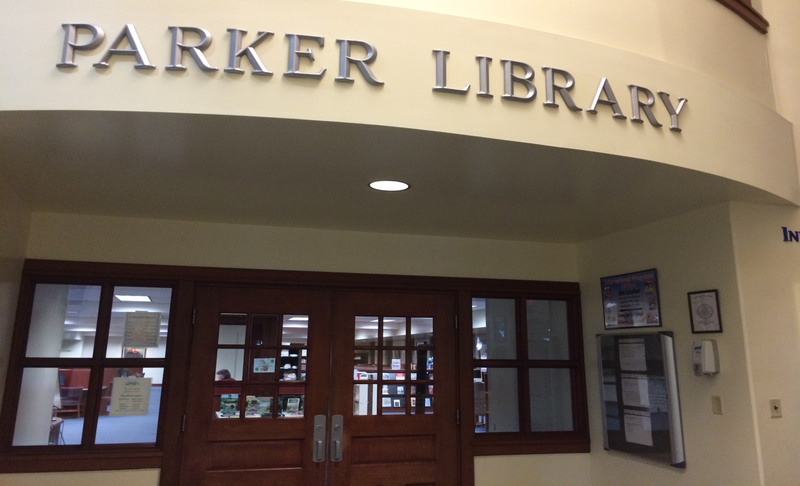 This is another one of the issues that makes change in the library world so difficult. In many ways we are a profession of generalists and, while individuals develop expertise in particular areas, our profession is simply too broad to be able to know everything. There is always going to be someone who knows more or has more experience or has been at an institution longer. Acknowledge this fact, remind yourself of this fact, but move past it. Getting caught in this web leads to paralysis and ultimately will result in failure. What you’ve done is opened the door for those who have always done something to continue to do it that way. This is something I still struggle with, but by continuously engaging my colleagues and asking questions I have been able to tap into their expertise and also create a forum where problems and concerns can be addressed. It’s going to be difficult, but by putting in the work you will gain the respect of your colleagues and start to develop expertise of your own. The active asking of questions is also helpful for identifying areas where further change can take place. People are well aware of the pain points of their jobs and will gladly let you know. Sometimes these can be fixed, sometimes the fix would require more work than it would reduce, but maintaining an open dialog about these things helps shepard along the change process. When people know someone is listening, they themselves will start to listen as well. And what of that person who truly hates change and will resist it every chance possible? These are the times where the work leading up to the change is so valuable. That the change was vetted and approved by management is crucial. Sometimes the ultimate last resort is to point out that it’s going to happen regardless. This is where it can be difficult to stand up to those who have more experience or expertise. But it is vital to remain unwavering; I have experienced situations where I wasn’t entirely sure that the change was the right course of action but I had to bury those feelings and refocus on what I knew would be the gains of the change. This is where it is important to constantly remind people of the benefits or gains of the changes being made. Loss aversion is a common occurrence and it is really easy for people to focus on one or two minor losses while ignoring potential gains. You might have to sound like a broken record, but constantly reinforcing those gains will pay off. As we come to the end, it’s important to point out how crucial endings are for change to be successful. At some point, the past needs to be behind us. This is why I favor a scorched earth, burn everything to the ground approach. When you take away the ability to fall back you force people to make the change. That can cause increased resistance but it can also really jumpstart change. So question everything, abandon that which doesn’t work or is inefficient. Envision a better way and work backwards to get there. But more than anything, “Be the change that you wish to see in the world.” Mahatma Gandhi. Michael is the Collections Services Project Manager at Northwestern University. He holds a BA in Political Science from DePaul University and received his MLIS from Dominican University. He tweets at @michaelrperry6 and can be found on Google+here. This is his second post for Letters to a Young Librarian; the first was “Overlook Opportunities and Missed Connections” (back in the very early days of the blog). I have never been shy about discussing my nerdy t-shirt addiction on social media. I probably should have, because now I've got quite a few people who enable me by sending links to amazing t-shirts. Regardless, it occurred to me recently that I've never shared the true depth of my addiction. Time for me to fess up. 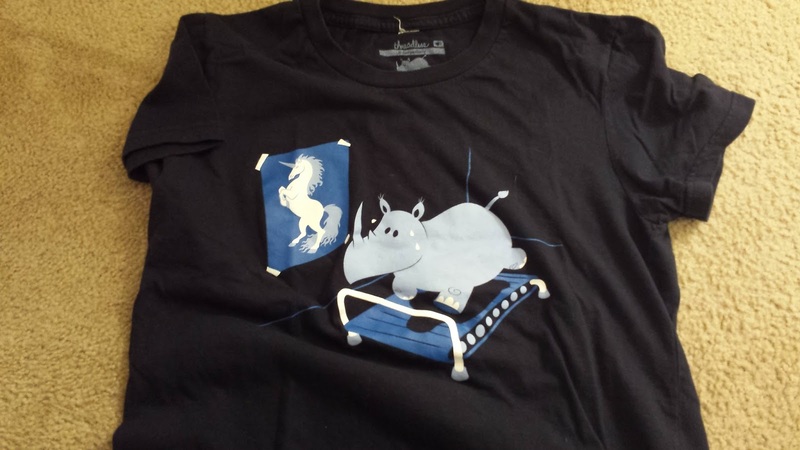 For me, this t-shirt, Running Rhino, embodies but makes light of the size acceptance movement. I don't wear it that often since I pick my t-shirts based on whomever I'm going to be around that day. There's the joke about unicorns still being around, but they gained some weight and turned gray. But rhinoceroses are fantastic in their own right. As are we all. 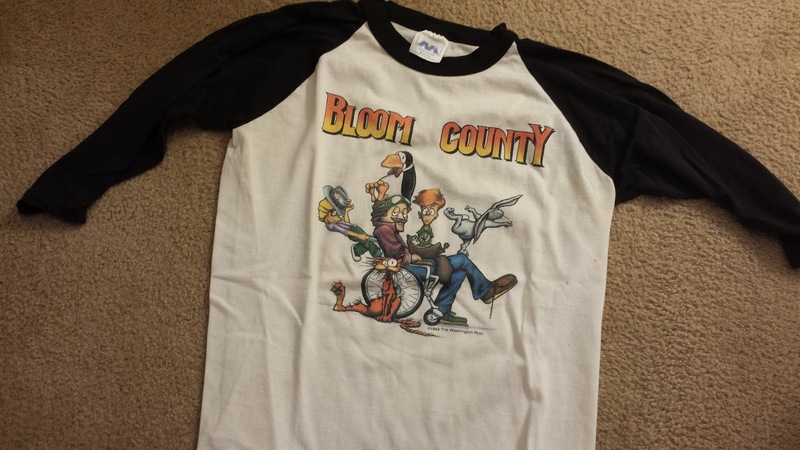 I've had this Bloom County t-shirt since the 1980s. I was/am a huge fan of Berkeley Breathed's work, and when I was still in elementary school I saved up my allowance and sent money with the form in the back of the book (that I had also bought with my own money) to buy this. 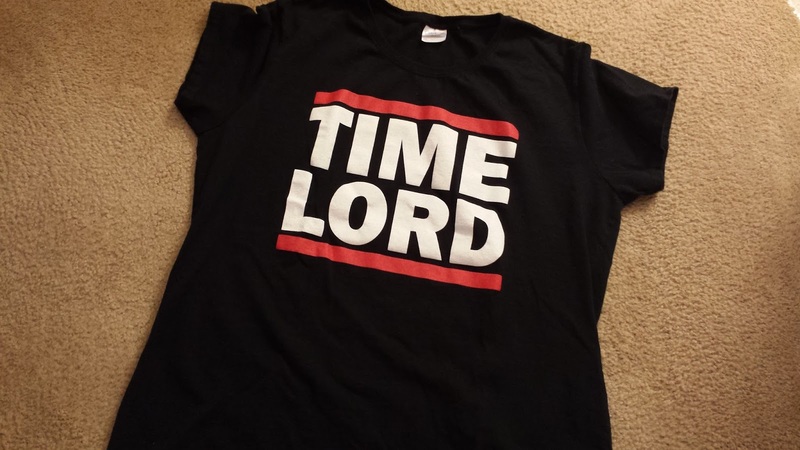 I have FOUR Doctor Who t-shirts, and another on the way. I do have a not-small obsession with that show, and have even been accused by a number of friends of actually being a Time Lord in disguise, so when one obsession meets another the results are predictable. My nerdy t-shirt isn't just about mainstream nerd. I also have a deep love of fairy tales, and Little Red Riding Hood is one of my favorite stories in that genre. This t-shirt reminds me of Roald Dahl's version, which is one of the best. This is definitely my favorite of my recent acquisitions. 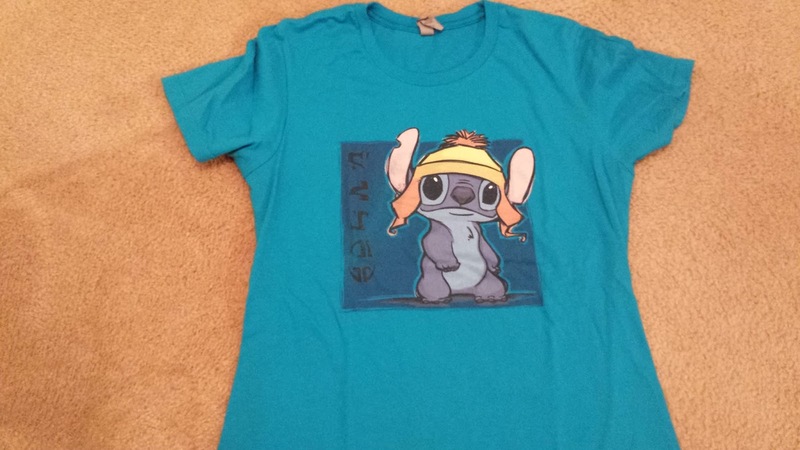 With my deep love of both Firefly and Lilo & Stitch, this shirt could have been made just for me. Beyond these, most of my fandoms are represented in my t-shirt collection. Lots of Calvin & Hobbes, Star Trek, Star Wars, Supernatural, video games, 80s cartoons, bands I love, and so on. I've promised myself I'm going to refrain from more t-shirt purchases for a while - I do have an addiction, after all. But the last time I made that promise to myself, it only lasted 6 months. So we'll see how it goes. Threadless. 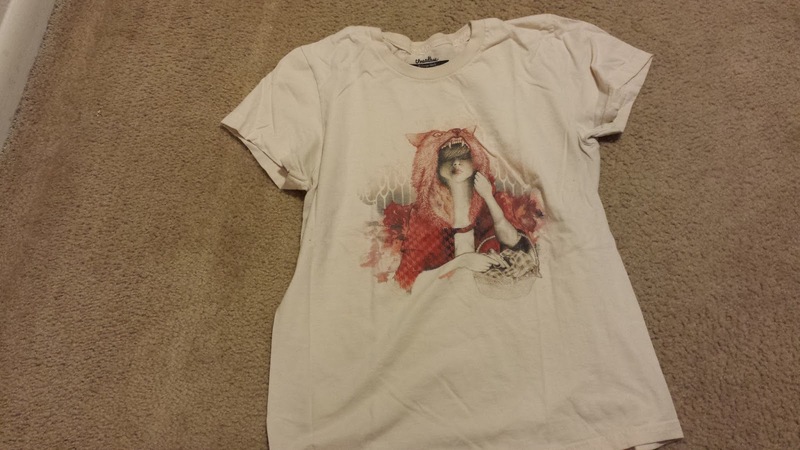 The Little Red Riding Hood shirt came from them. As did Running Rhino. RedBubble. More pricey than other places, but sometimes you just gotta have a t-shirt. I've got a "Ravenclaw Quidditch Team Captain" shirt from them that I wear way too often. Woot. They have daily shirts for cheap ($12) and most of their past designs are available for a little bit more ($15-ish). TeeFury. Another daily shirt place. So dangerous because you can't wait and make your decision in a couple of days, because it will be too late. I know there are tons of others, but I'm going to stop there. How about you? Do you have a nerdy shirt collection? If I missed your favorite place, feel free to add it in the comments section.